It’s Thursday night in Sydney. The working week is winding up and Crown Street is buzzing with people darting in and out of restaurants and bars. 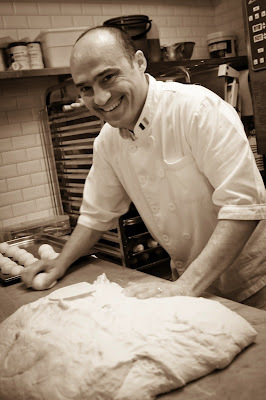 Sicilian cuisine is the focus of Caffe Sicilia, the new restaurant venture by owner Phillip Visalli of The V Group - a family run business responsible for several hotels and restaurants in Sydney and Italy. 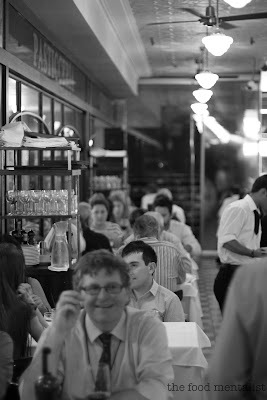 Opened in March 2011, Caffe Sicilia is reminiscent of a 1940’s style caffeteria - think black & white checkered marble floors, white table cloths, smartly dressed Italian staff and, a cool vibe. 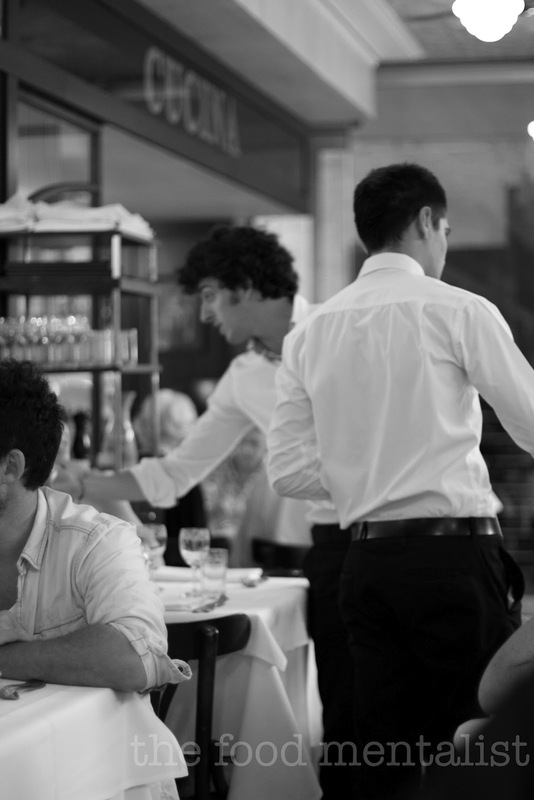 A real sense of Sicily awaits diners. Service is charming and they know their stuff. Doriano our waiter, is friendly, attentive and offers us several recommendations on request. Sicilian cuisine is largely based on Italian food with hints of Greek & North African influences and Caffe Sicilia’s menu reflects this. The menu is characterised by a variety of traditional Sicilian dishes which include a fantastic selection of seafood along with classics like Sweet & Sour Sicilian Rabbit and Sicilian Seafood Cous Cous. 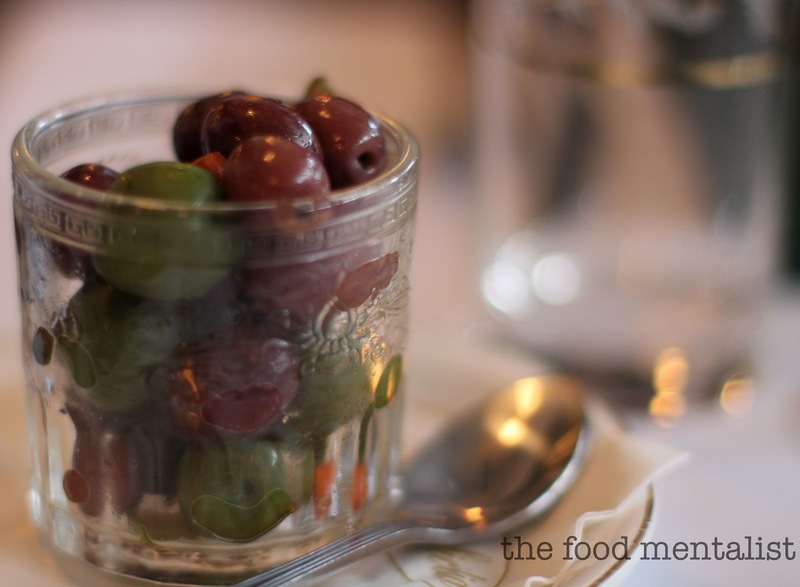 Mixed olives greet us at the table. They are fresh, buttery and not overly salty which we both enjoy. Bread arrives and it comes with a dish of delicious fruity olive oil and balsamic. 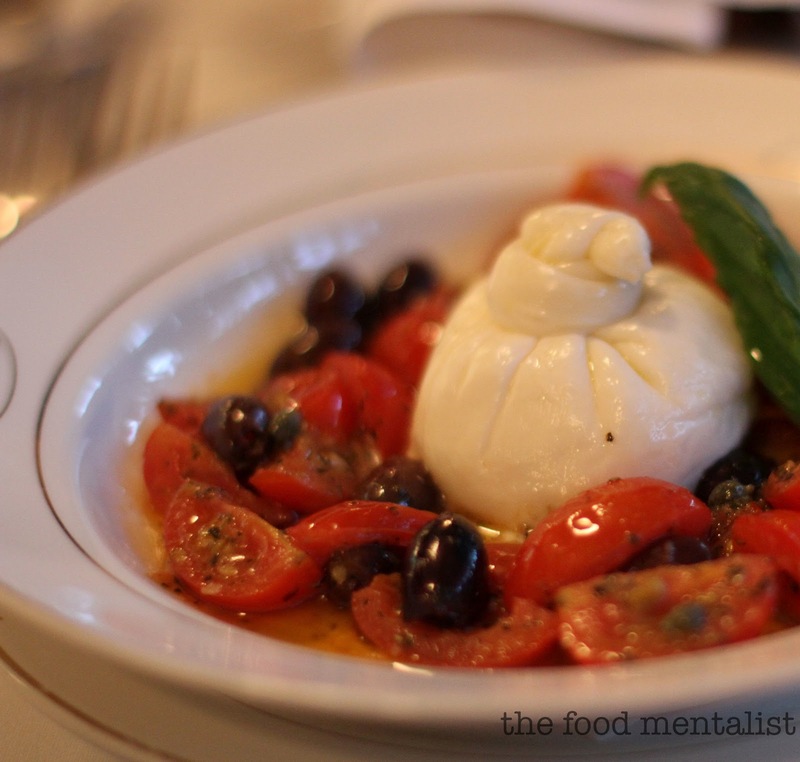 Our starters don’t take long to appear and I am very impressed with the burrata which sits on a bed of cherry tomatoes, olives and basil and is dressed with ‘mediterranean olive oil from the sea’. I can taste hints of anchovy and capers which work really well with the tomatoes. The sweetness of the plump cherry tomatoes is perfectly balanced with the creamy velvety centre of the burrata and it just melts in the mouth. The burrata has that characteristic fresh milk tanginess and is pillowy in texture. This dish is so delicious I find myself not wanting to share it with Pete. I finally give in, deciding that he too should be able to enjoy the flavours of this dish. 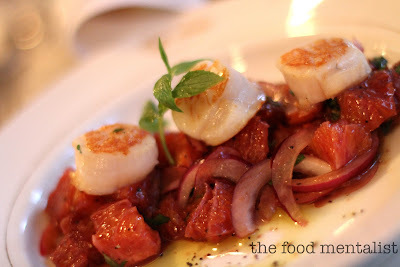 The Sicilian blood orange salad comes topped with three plump scallops which have been caramelised perfectly. The salad itself features blood orange pieces, spanish onion and a scattering of herbs, all dressed with an olive oil and vinegar dressing. Before our first course arrives we ask Doriano if he can recommend a nice Italian red by the glass. Even though our meal choices are leaning toward a white wine pairing, we decide to opt for a red as we both really enjoy our reds and the wine list at Caffe Sicilia has an extensive array. Doriano recommends two glasses of the 2008 Zenato Valpolicella Classico from Northern Italy. It is a nice easy drinking red and we both enjoy it. Our first course pasta dishes arrive. These ravioli are handmade each day and are filled with beetroot and buffalo ricotta. The beetroot is intense and beautifully sweet and is matched by the subtlety of the buffalo ricotta. 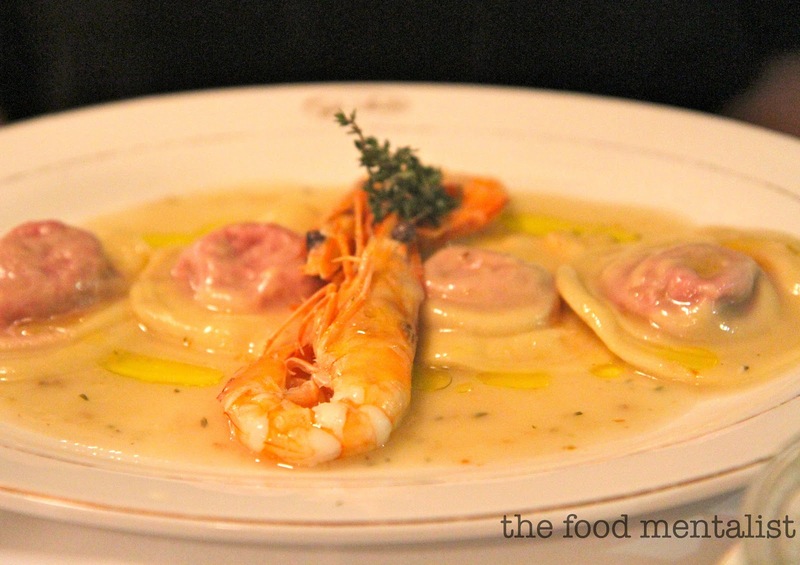 The ravioli is perfectly al dente and is dressed in a white wine and thyme reduction and topped with two king prawns. I find the sauce just a touch plain, whereas Pete loves it and believes it works well to balance the beetroot flavours in the dish. The king prawns are a nice size and are firm and sweet. This dish leaves me wanting more of these delicious ravioli. 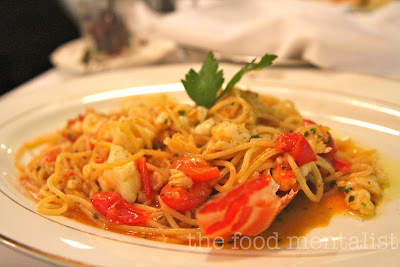 The spaghetti is topped with a 200g ½ lobster tail and has been tossed in a cherry tomato juice. Tempting morsels of tender lobster are tossed throughout the pasta and cherry tomato juice matches the sweetness of the lobster really well. Pete finds the spaghetti a little too firm, whereas I prefer its texture. The literal translation for this dish is Snapper ‘Crazy Water’ - however to Italian’s it simply means poached white fish. 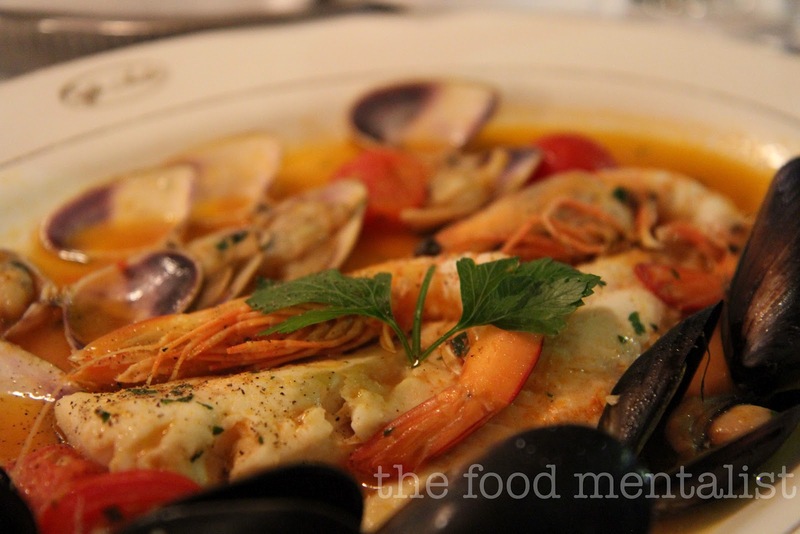 The snapper is cooked just right and it is accompanied by a generous serving of mussels, vongole and king prawns all poached in a white wine, cherry tomato and parsley reduction. The seafood is fresh and the dish encapsulates the flavours and ingredients of the cuisine. Simple and classic. I absolutely love calamari and squid dishes and so I jump at the chance to try this dish. 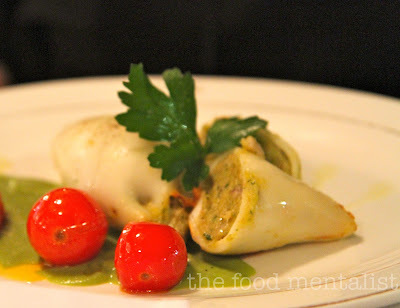 The calamari is stuffed with a Sicilian crumb filling with prawns and sits on a bed of pea puree. There are also several oven baked plump cherry tomatoes on the plate. The calamari is tender and the stuffing is an interesting combination of flavours including a bread like stuffing with pine nuts, herbs and prawns. These flavours work really well with everything else on the plate and the pea puree is smooth and sweet. By this stage we are getting pretty full and sit back and take in the surrounds as people and cars continue to buzz up and down crown street. Perfectly timed, a young guy zooms past on a Vespa and you could easily be mistaken for thinking we are somewhere in Italy. Before too long, Doriano brings us some delicious granita and explains that we have strawberry, pineapple, almond and pistachio to sample. He also mentions that pistachio is his favourite. Having never tried ‘traditional’ Italian granita like this before, Pete and I are both wowed. The flavours are intense and its extremely moreish! The texture of the granita is deliciously smooth and this partly a result the Carpigiani Maestro (a granita & gelato machine) that head pastry chef Giovanni Pistritto employs to make his famed dessert. It is the only machine of it’s kind in Australia. All the flavours are amazing, Pete decides the strawberry is his favourite and like Doriano, my personal favourite is the pistachio. I also love the almond - marzipan lovers unite! Bliss. I am partial to a small glass of limoncello and I always keep a bottle in our freezer at home - believing it’s the perfect after dinner digestivo. 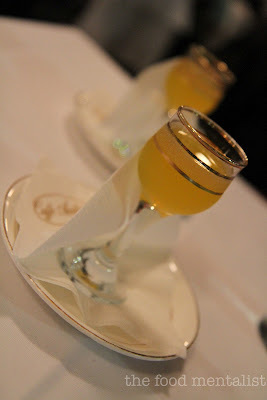 So when Doriano brings us two glasses of Caffe Sicilia’s house-made limoncello I am delighted. He tells us that this one also has a hint of orange. It’s sweet and syrupy and the zesty flavours of the lemon and orange are evident. The perfect way to finish the meal. I have never been a huge fan of cannoli, whereas many of my friends just love it. However I am now convinced that the reason behind this is that I have never been offered one as good as this one. Doriano brings us one of Giovanni’s creations and it is delightful. The crisp shell is filled with a creamy sweet ricotta filling and topped with candied peel. I have always been a big fan of a famed Sydney ricotta cheesecake and I quickly decide that this is it’s cannoli equivalent. Finishing on a such a high note, we float up Crown Street towards our car. Chef Pistritto, how did you get started in the food industry? In Italy, food is one of the things that bring families and friends together. From the time I was born in my hometown of Lentini, I was always surrounded with family who loved eating and making pastries. When I was 13 years old, I started working for a local café/bar and from there learned the basics of making pastry. 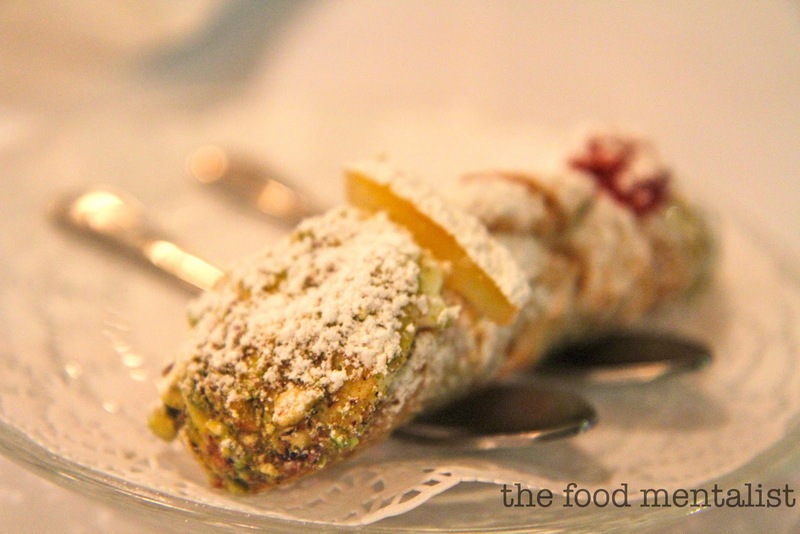 This experience inspired me to learn more about Sicilian pastry, which I love eating! In 1994, I had the opportunity to work for Lentini’s most famous pastry chef Giuseppe Caltabano at Café Cristal. 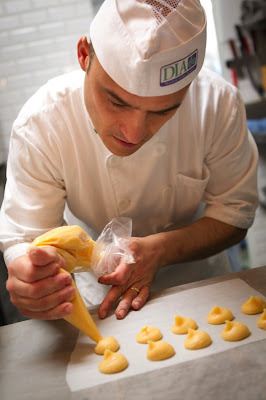 He taught me everything I needed to know about Sicilian pastries – from the texture and flavour to technique and presentation. Three years later, I became the head pastry chef at another café in Lentini called Etna Bar. 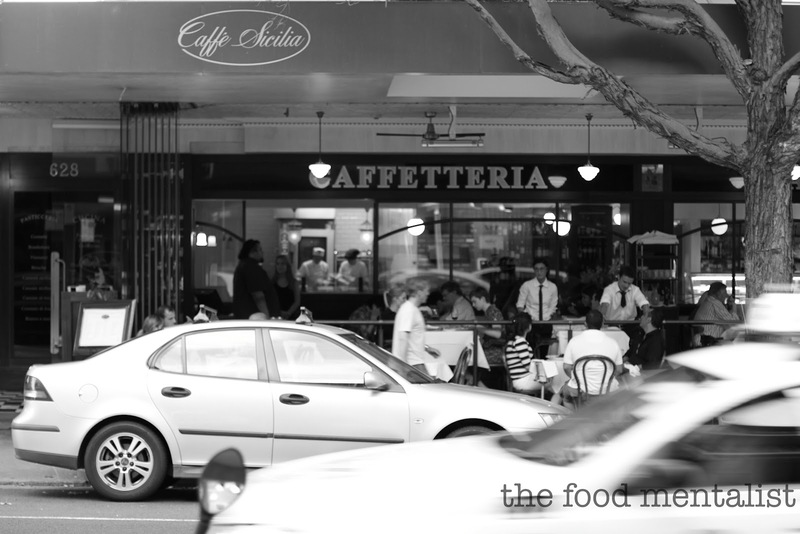 Then, I met Caffe Sicilia’s owner Phillip Visalli who brought me out to Australia to work for his restaurant. was surprised at first but that was my eye-opener. I love my seafood so it would have to be the Spaghetti all’Aragosta, which is pasta, packed with lobster tail meat tossed in a slow cooked lobster & cherry tomato juice. Need I say more? I was very excited when I found out that our owner Phillip Visalli bought a Carpigiani Maestro machine, which is used to make gelato and granitas. We are the only restaurant in Australia to have this equipment so to work with it is such a privilege! 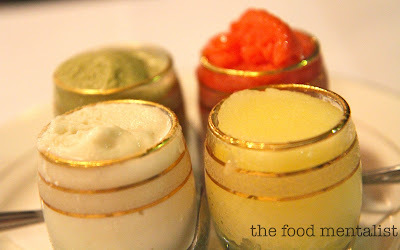 At Caffe Sicilia, we make four different granita flavours a week and we sell them for $4.50 each. At the moment, we have pineapple, pistachio, strawberry and almond (a favourite in Sicily) and our customers are definitely enjoying it. We use fresh and all natural ingredients to create the granitas. It’s most enjoyable during a hot summers day paired with a brioche. It’s refreshing and you’d want more of it. We will soon be introducing different flavours of gelato too!What do you see as the new trends in pastry? 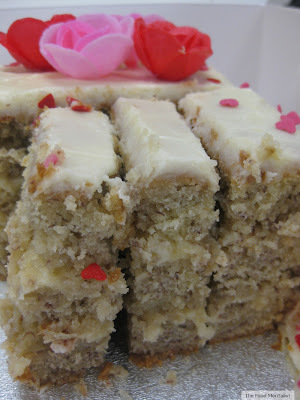 of pastries/desserts that are not overly rich and sweet. They also look for pastries/desserts that are appealing to the eye and capture their attention. Customers are a lot more curious about where restaurants source their ingredients and how a product is made. What are the most challenging aspects of being a pastry chef? Being a pastry chef requires a lot of hard work and patience. I’m at work ready to go at 4.30am to prepare for the day. I’m a perfectionist and all about attention to detail and consistency. I have to make sure that every single pastry/dessert that leaves my sight is perfect. If I don’t like it then it goes straight to the bin. Making pastry is very delicate and requires a skillful technique therefore I also make sure that my apprentices are well trained. When you have many years of experience in the field, it can be difficult to teach people skills and techniques that now come naturally to me. I am very lucky that my apprentices at Caffe Sicilia are all from Italy therefore they have an appreciation and understanding of what the finished product should look and taste like. What are your 3 favourite ingredients to work with? The basics – flour, sugar and butter. What is your favourite dessert at Caffe Sicilia? If I had to choose one it would have to be our strawberry tart. The Food Mentalist & Pete dined as guests of Caffe Sicilia & Wasamedia. Tell me, do you like Sicilian cuisine and are you a fan of cannoli? Wow - the seafood all looks divine! I've been meaning to get here since they opened, if only for a canoli! Great review ... I'm salivating just looking at the great pics of the dishes you had... I'm making a booking ! Heading there on Wed with Josh, can't wait. Dishes look so great and we will be trying the almond menu. The whole meal looks absolutely delicious. Such a perfect menu.